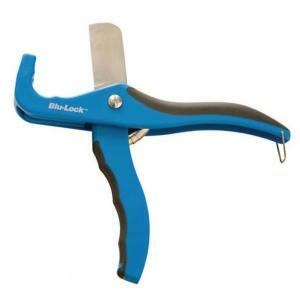 This is the perfect tool for cutting your Blu-Lock tubing and swing pipe. This 1" tubing cutter has spring loaded handles and a comfortable ergonomic grip. Precision ground stainless steel blades will stay sharp through your biggest jobs. Great tool for cutting your Blu-lock tubing and any other polyethylene tubing, rubber hose and class 200 PVC one inch and under. For best results, place tube/pipe in cradle, opposite of blade then and close handles, rotate up and down while squeezing handles. Please Note: This is not a ratcheting cutter.